← Let’s Talk About Zumba! July 29, in case you missed all 200 posts on Facebook and Instagram, was my and Jay’s six-year dating anniversary. Since we only have two anniversaries and no children’s birthdays to worry about, we still like to celebrate it. Plus, it’s a good excuse to do something fun in the summertime that’s just the two of us. During the summer months, my co-workers and I work an extra 45 minutes for nine days and then can take the tenth day off, usually on a Monday or a Friday of our choosing. I used one of my summer days on Monday and Jay had the day off by luck. We decided to finally get to the beach, something that we haven’t done since our honeymoon in May 2011. 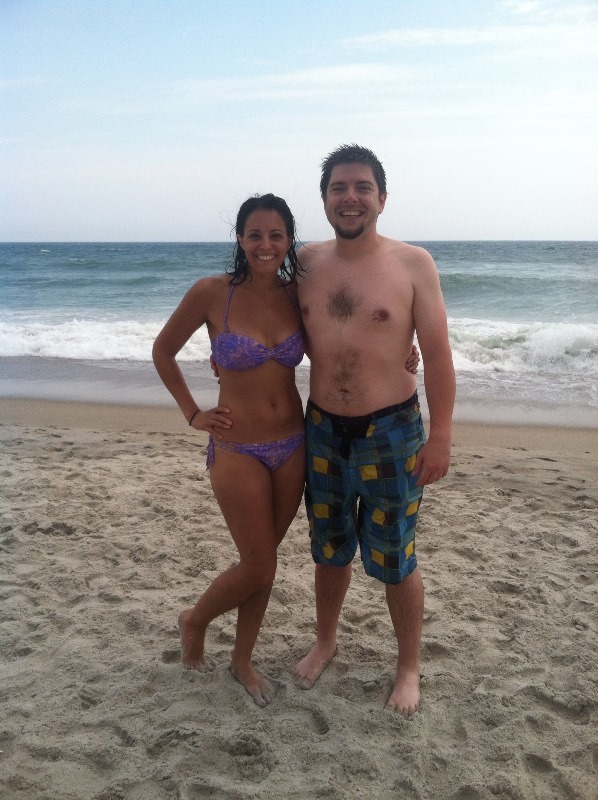 If we’re discounting honeymoon beach time, then we actually haven’t gone to the beach together since Summer 2008. We headed out to Wrightsville Beach in Wilmington, NC. We had a perfect beach day – it wasn’t too crowded, the sun was shining but periodically covered by clouds to give us some relief, and the water was the perfect temperature with just the right amount of waves. It was great. Around 2 p.m., we noticed that the approaching sky west of us was very dark, so dark that it couldn’t mean anything other than a storm was a-comin’. We were both starving anyway, so we brought our stuff to the car and headed down to this Mexican restaurant that we used to go to every time we’d hit up the beach. [Side note for old school Jay and Jack listeners – This restaurant is actually the infamous location of where Clif, back in his Hybrid days, tried to use some of his pick-up artist skills to hit on our waitress who in turn only had eyes for Jay! I believe that was also the day that Clif told us about hitting the girl in the club on the head with a water bottle. Both stories were told on the Married Man Show. Ah, memories. Good times, good times.] We got to the restaurant just in time for the thunder and lightning to start. So, over food and margaritas, we came up with a plan for an anniversary adventure. 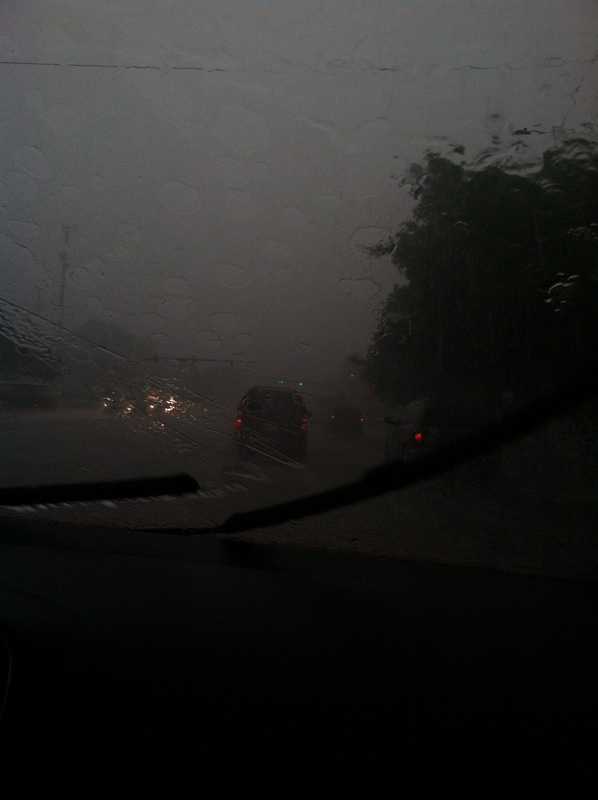 The really heavy rain started almost immediately as we sat down in the car. 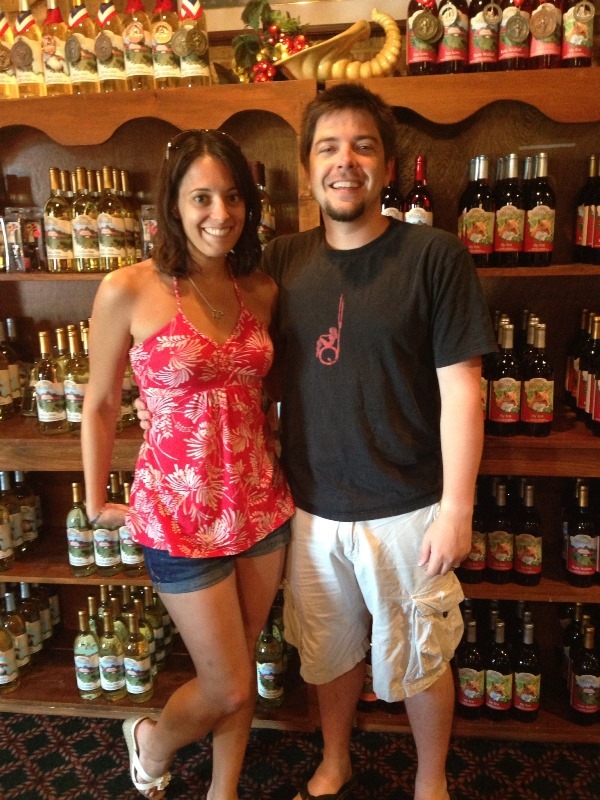 We did our best to dry off and headed back east to Benson, NC to revisit Gregory Vineyards, the winery we went to back in March, stopping briefly to change out of our bathing suits and into dry clothes at a smelly rest stop. Just like before, we had another Groupon deal to the winery for a wine tasting with cheese and crackers and a bottle of wine to take home. It was nice and sunny back in Benson and we ended up taking some pictures and buying a bunch of wine at a really discounted price to have for when my family visits us next weekend. They have this red wine called Lee Love that is too sweet to drink on it’s own, but tastes great in brownies (I tried it) and actually makes a spectacular wine slushie (which I’ve also done), so we bought a bunch of bottles of that. When we left Gregory Vineyards, we were running short on time because we had to be back in Raleigh for a 7:15 p.m. dinner reservation. I’d say once we got home, we had about 40 minutes to shower and get out the door. This is how my hair ended up being pulled back into a bun – and I note this because my change in normal hairstyle got some attention on social media, haha. We went to dinner at a restaurant at North Hills called Midtown Bar & Grill. We had (wait for it…) a Groupon there. Honestly, without Groupon and Living Social, I swear, we’d never have tried half the places or done half the things we’ve done over the past two years. The atmosphere was much different than the impression I got from it walking by it. It’s on the pricier side, yet people were in there with t-shirts and shorts, so I was a little surprised and a little over dressed, lol. The food was spectacular, though. I had this amazing flank steak with blue cheese that literally melted in my mouth. I want to eat it all of the time. We had told our waiter that it was our anniversary (conveniently leaving out that it was just our dating anniversary, haha) and he was kind enough to bring us strawberry and caramel cheesecake for dessert. 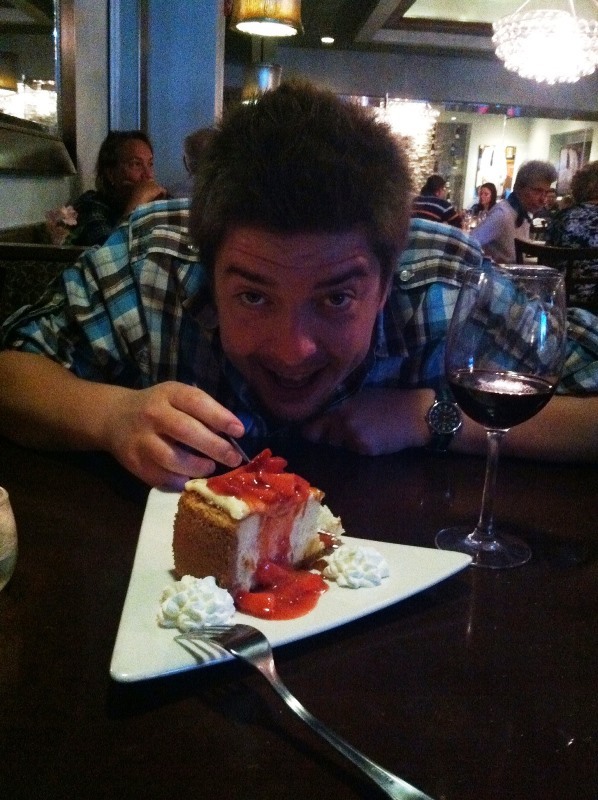 Strawberries and cheesecake are pretty much two of Jay’s favorite things ever, so he was in heaven. All in all, it was a fantastic day. 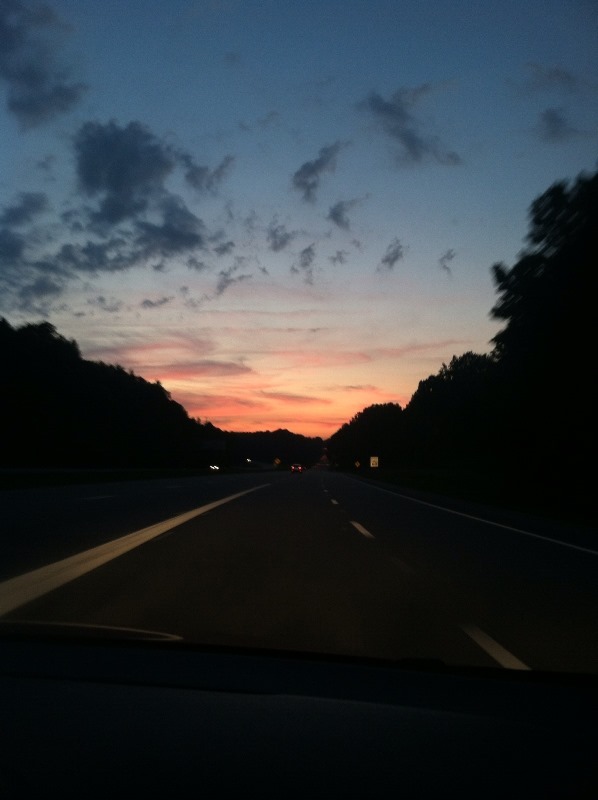 We even had an awesome sunset while driving home. I’m so glad that we were able to spend the day together. And here’s the kicker – we were so exhausted on Monday night that we were both in bed passed by before midnight, lol. Beach, margaritas, wine, steak, sunset, and a good night’s sleep. Now that’s what I call an awesome anniversary. 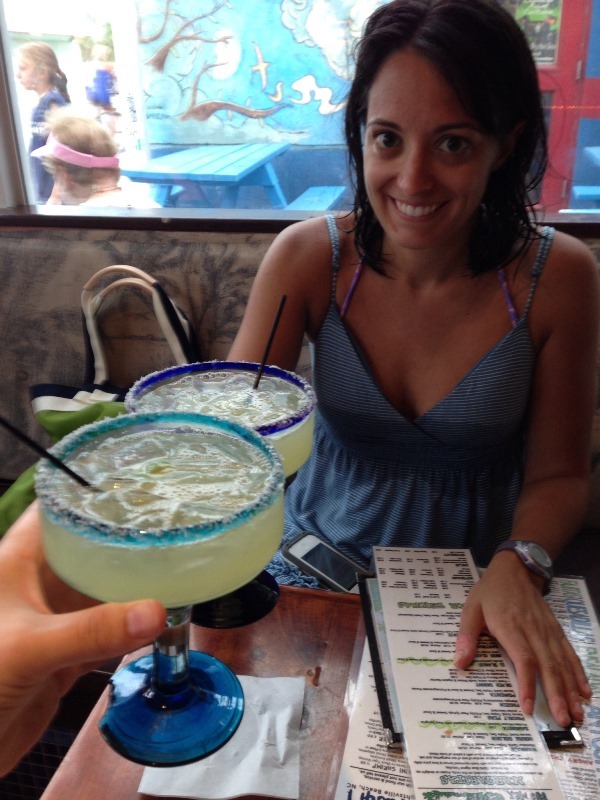 Thumb’s up for being in the water (and sun). 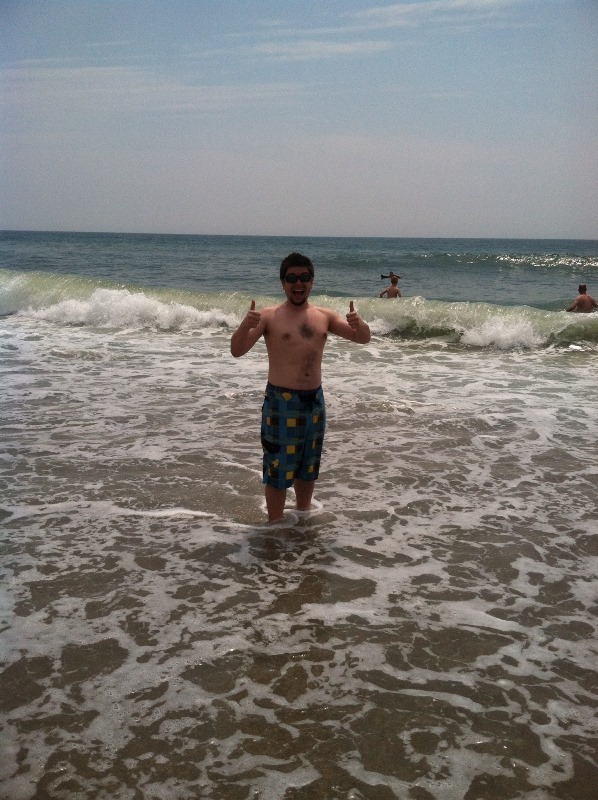 Thumbs up for not being freezing in the water. 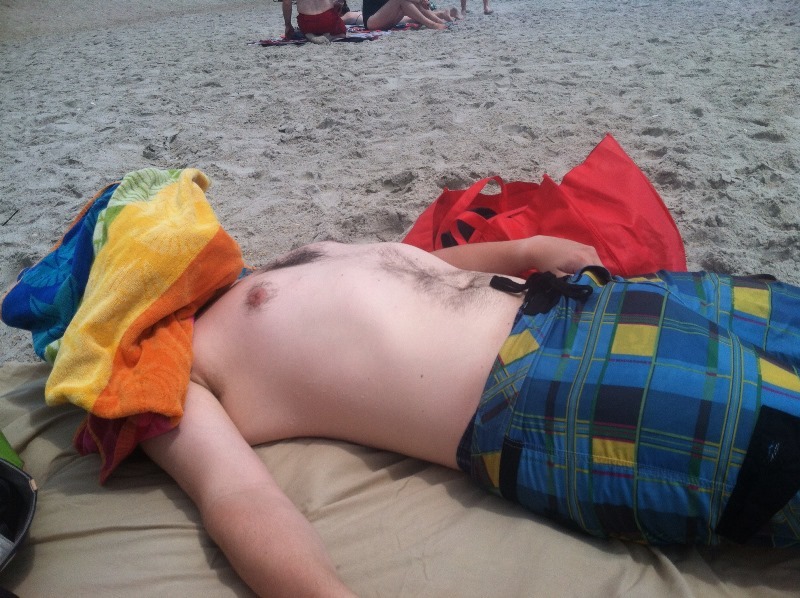 Jay trying to avoid getting sun burn on his face. He did get some good color yesterday, though. 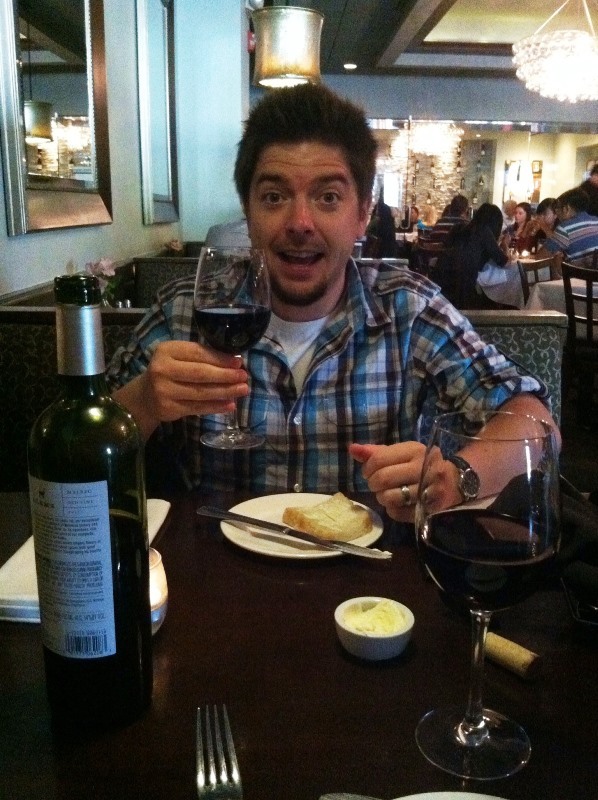 A toast to six years. The storm as we were leaving Wilmington. 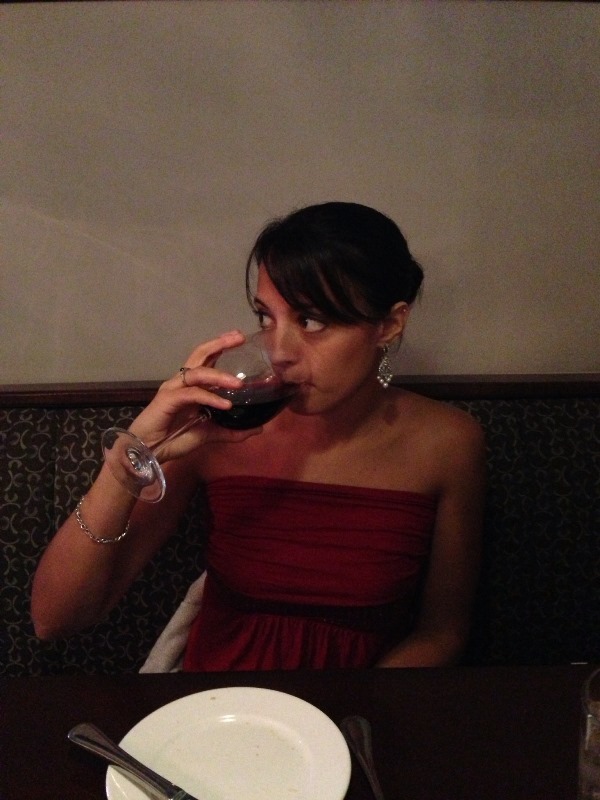 I was not so artsy, but cheers! Jay’s dream dessert: Strawberry caramel cheesecake. Sunset. Since I’ve gotten Instagram, I’ve never met a sunset that I haven’t tried to take a picture of, hahaha. 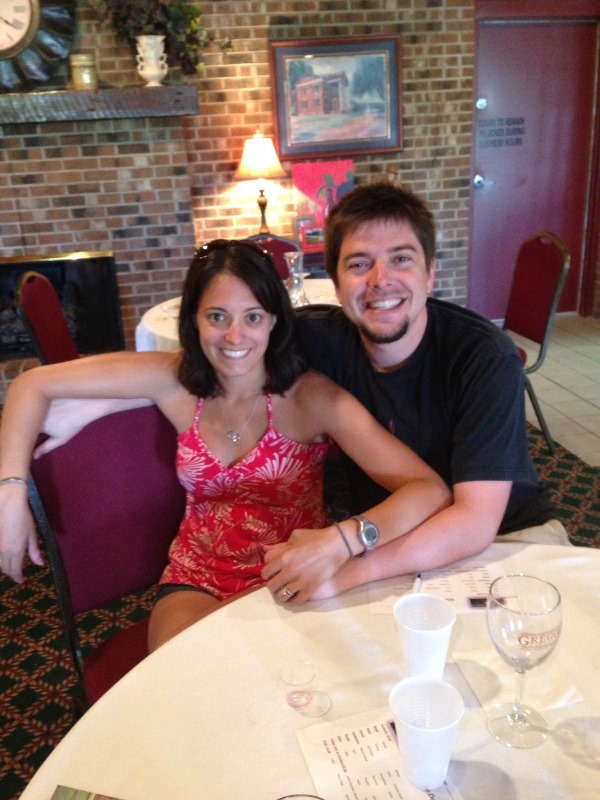 This entry was posted in Adventure, Jay Glatfelter, Married Life. Bookmark the permalink.